"A slump in exports raises questions about how effective Prime Minister Shinzo Abe's economic policies would have been without Chinese help." This is a truly bizarre sort of argument. China has the largest economy in the world on a purchasing power parity basis. It is also very close to Japan geographically. It would be utterly nuts for Japan not to turn to China as a major market for its exports. Furthermore, most projections show that China's economy is slowing, not going into a recession. But, even if it does fall into a recession, it is unlikely that it will last forever. If China has a growth rate of 5.0 percent annually coming out of the recession (far below its recent pace), it will be by far the fastest growing market in the world in absolute size. Japan's businesses would surely want access to this market. "Longstanding problems like deflation, bureaucracy and a shrinking population added friction to the country's growth. "As deflation pushed down prices, companies struggled to increase profits. Deflation generally discourages consumers from making major purchases as they wait for lower prices and better deals." Japan's rate of deflation has only exceeded 1.0 percent in 2009. With a rate of deflation of 1.0 percent, a $20,000 car would sell for $100 less if buyers waited six months. It is unlikely that many consumers will make that decision. In this respect, it is worth noting that computer prices have fallen at double-digit annual rates for most of the last four decades. This has not impaired sales in the computer industry in any obvious way. "Increasing government spending has also proved tricky. "Japan has the highest level of debt in the industrialized world, so finding money to spend can be difficult." 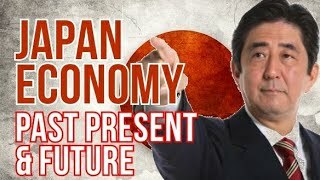 "According to the IMF, Japan's per capita GDP has increased by an average rate of 0.9 percent annually between 1990 and 2018, while this is somewhat less than the 1.5 percent rate in the United States, it is hardly a disaster. In addition, average hours per worker fell 15.8 percent in Japan over this period, compared to a decline of just 2.9 percent in the United States." The story of Japan's economy being in desperate straits is entirely a media invention, it is not based in reality. But it is a bizarre economy, isn't it?